With the advent of laser dentistry in 1994, lasers are a positive treatment advancement to traditional dental procedures. 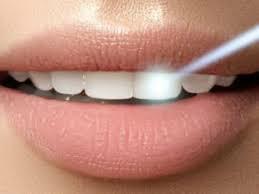 Laser dentistry harnesses energy into highly concentrated rays of light to treat a wide range of dental concerns. These lasers can be used to heat, cut or vaporize soft tissue. Lasers used in dentistry are different than those used for aesthetic treatments or cold lasers used for inflammation, headaches or other types of pain. New Look Dental uses the state-of-the-art SOL® Portable Diode Laser due to its powerful and precise technology and ability to treat multiple dental conditions. The main dental problems that lasers are used to treat include gum disease, canker sores, and cosmetic gum re-contouring. • Periodontal Gum Disease – laser dentistry is used as a gum infection treatment to kill bacteria and eliminate infection. After the laser enters the infected gum pockets, an ultrasonic root cleaner is used, heat from the laser is used to seal the tissues and stimulate stem cells to promote new tissue, collagen and bone formation. • Canker Sores – Lasers are used to remedy the pain associated with canker sores and shorten the healing process which usually takes 10-14 days. Additionally, while lasers don’t eliminate the root cause of cankers sores (HSV1 or Herpes simplex 1 virus), they can prevent them from repeating at the same site. • Cosmetic Gum Re-contouring – When teeth appear shorter than the rest, cosmetic gum re-contouring is a great cosmetic dentistry procedure. It removes the extra gum and increases the height of the crown portion of the tooth, to beautify and reshape a smile, as well as the teeth. While this reshaping is historically done by hand, New Look Dental uses a laser due to the numerous benefits. • Biopsy for cancer detection or lesion removal. • Stained or discolored teeth: Laser dentistry is one of many teeth whitening methods used in cosmetic dentistry to speed up the lightening process. • Cavities: Lasers are used to remove cavities in teeth without fillings where the cavity is not between teeth nor too large. • Minimally invasive, with preservation of healthy portions of teeth. • The treatment time and healing process is shortened. • Incurs less discomfort during the procedure and post-operatively. • Produces less swelling, bleeding and risk of infection. Dr. Kirakosian, as a general dentist and teeth whitening dentist, can expertly and conveniently perform laser dentistry procedures in office and refers more complex cases out to specialists.